After Vlkyire renewal today I logged in and was able to play in the orc dungoen as soon as I used butterfly wings to get to Pontera I get this.....For kro why should we in IRo suffer?..........Plz fix the bug as soon as possible........Most importantly how long will it take to fix the bug? The client still does not recognize WoE2 broadcasts as WoE broadcasts. Because of this, WoE2 broadcasts can not be confined to any particular tab. Yet it has not been enabled/activated on my skill list. i think im bugged T____T. Okay so I did the quest and supposedly successfully learned the skill but it's acting as if I don't have it for some reason. Skill icon still greyed out. Bug? Uhm, I'm not sure if this is intended but, Killing Cloud is currently being reflected by Valk mant (and I assume other reflect methods as well). It's not even a melee attack, heck it's not even physical. What gives? Here is a screen shot showing Over Refine Bonus on a 1 Handed weapon. Bows DO NOT have this bonus!!! Please fix this. Also upgrading Bows do not give Matk either. Don't know if this is intended or not but it makes users very weak with the nerf to Dex. Edited by Clogon, 31 October 2010 - 09:34 AM. What is more, bows are two-handed weapons so they should benefit even more from the over refine bonus or at least their base atk should be higher. Edited by Seraphiel, 01 November 2010 - 04:38 AM. 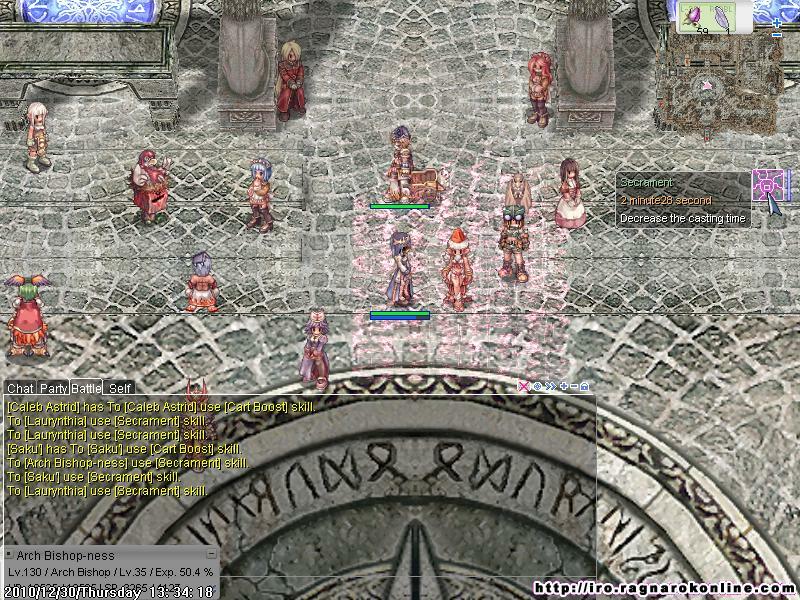 -Ledger of Death has been updated to activate Hell's Judgment with Sorcerer classes. 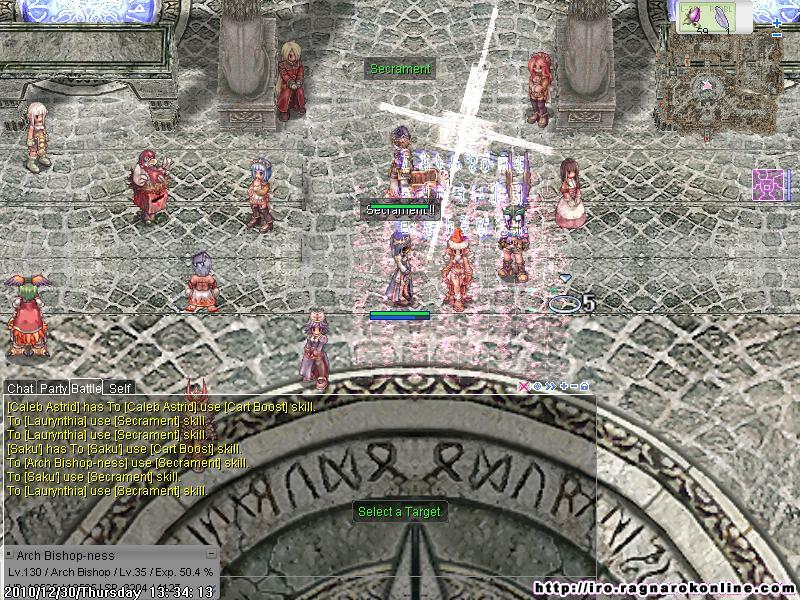 -Eden Group 71+ quests will be looked at for a script update. 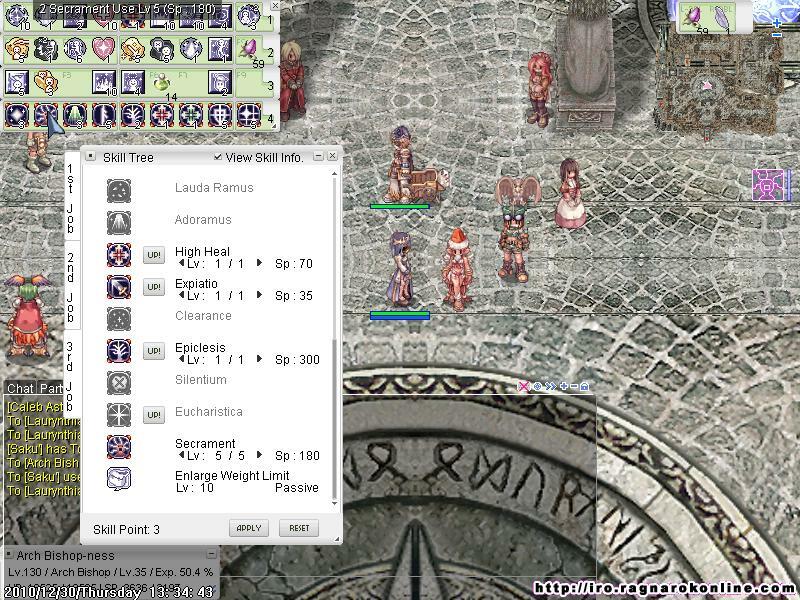 -BG & KVM npc now allows 3rd jobs to purchase rewards with Badges and KVM Points. -Payon tool dealer is selling all the wares he used to pre-renewal. -Duplicate character naming displays proper error message. -Ayothaya Dungeon entrance quest will ask for Fabric and Nine Tails after the 11/10 maintenance. The mail system is enabled on Yggdrasil and Ymir, but not on Valkyrie. There are too many maps on which, for no apparent reason, you can't memorise a Warp Portal point, such as the Morroc Ruins (moc_ruins) and Juno Field 8 (yuno_fild08). If it hasn't been already, dragonfly should be moved back to gef_dun00 on Valkyrie because there are bots on the map it normally spawns on (moc_fild18), which gives the bot owners control over the primary source of clips. Edited by richard, 26 March 2012 - 02:14 AM. Added issue with mercenary HP reported by PurpleHaze in bug report section. There is a problem with drops from Yao Jun called Claire Suits. I do not know if they were posted earlier in this thread but the Claire Suits cannot be worn even when i'm above the lvl stated which is 22. It says any class can wear it except novices. It also tells you its not slotted, but its hidden slotted. The description as far as I know, it can only be worn by Trans, lvl 22 and above and have a slot, not a hidden one. So please fix the description and add the card slot as visible. BG Valor Huuma Front Shuriken is NOT working. Tested it 10 times in pvp, and the proc for double damage still does NOT do double damage for killing stroke. Either take out that description or fix it. This is actually working as intended. Wearing any shield reduces your aspd. Try wearing just the Thorny Shield and compare it with wearing Thorny Shield+Bison Horn and you'll see a good increase in aspd. I'm BEGGING you, to PLEASE disable manhole for use on other players when in town. It's incredibly aggravating to be manholed when you're trying to walk to storage, and should only be available in PvP and on non-town maps. Level 10 mercenary scrolls weigh 10 despite their description stating they weigh 0. Rainbow cake doesn't have a corresponding status icon (on the right of the screen). The titles of the labels for the Endow skills' status icons are erroneous. For example, Endow Blaze's status icon label is titled "Flame Launcher". Edited by richard, 12 February 2012 - 04:04 AM. This skill is still called Secrament in every single place possible. The correct spelling is Sacrament. Ninja quest log entry says you need 5 cyfar but you really need 5 iron ore. In Endless Tower, the wrong floor is saved as a checkpoint when you pass floors 25, 50, 75, and 85. You can teleport into the centre of the crater in Morroc (only tested on Valkyrie). You can't walk around the left side of Santa's house in Lutie unless you hug the wall (only tested on Valkyrie). Edited by richard, 03 April 2011 - 04:54 AM. For Sura class, attempting to use Earth Shaker while auto-attacking with Raging Trifecta Blow results in an error that says "Tied to Dragon Combo Skill" and doesn't activate at all. There is nothing in the description that says it is a Combo skill unless we are supposed to assume it is since the Pre-Req for Earth Shaker is Dragon Combo and Curse Circle which still doesn't make sense. Another thing, Lightening Ride seems to have a problem activating but this might be due to lag moreso than a bug so disregard unless others are suffering the same problem. The mechanic's Flame Launcher skill doesn't work unless the item Magic Gear Fuel is present in the player's inventory. It doesn't consume any, but unless they're in the active inventory the skill won't work. Edited by Avak3n, 10 January 2011 - 06:13 AM. It seems that when a homunculus gets the new SE Burning and then dies or is vaporized while affected, the little sign on it won't ever go away, even if the homunculus isn't affected anymore. I didn't test this further, and I couldn't test if getting the SE will always cause this bug or it happens only when killed/vaporized, but my Vanilmirth has been showing the little flame over it for many hours already, and it doesn't lose HP or anything, just that annoying thing over it. I sent a ticket already for my particular iassue but I guess this should be looked at. The Kafra employee in Payon at (180, 104) won't rent pushcarts to mechanics. Edited by richard, 03 April 2011 - 10:16 AM. When using a homonculus, and they get the paralyzing effect from Bathories and Sohees that does the little lightning effect... if you stay on screen, after the paralysis effect wears off, the image does not. And then they start stacking. I've had my filir fly around just fine with eight of the fields on him. I'll attempt to get a screenshot of it next time I go to B4 in clocktower.